Personally speaking, I’m more of a pie fanatic. Sometimes though, I need cake. Seriously need cake. Unfortunately, when these moments strike cake cannot be made before the craving forces me to do dumb things. For this particular cake I baked it much too late in the evening. I attempted to let it cool, but I simply had to have cake before I went to bed and it was already 10pm! So I frosted it warm. Well you know what happened next, cake started to slide off and frosting ran down the sides onto the plate. I ran outside in my pajamas to the cool porch with cake in one hand, two frosting covered spatulas in the other hand and quickly set it down on the table. For the next 30 minutes I attempted to hold the cake in place with one spatula while scooping frosting back up with the other. I should have just given up on pretty cake and eaten it out of a bowl. My neighbors probably had a good long laugh about it. I just hope they didn’t take pictures. 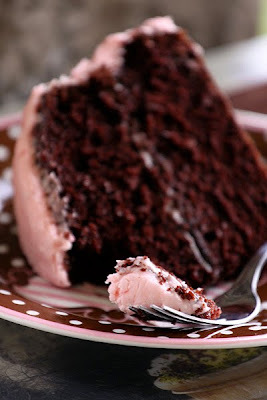 Ooo this is good moist chocolaty cake, and even better with strawberry frosting! It’s from the Better Homes and Gardens New Baking Book, a baking staple in my home. I've adapted it for a one bowl method. 1. Preheat oven to 350 degrees. Grease two 9 inch, 8 inch, or a 13x9 inch pan. For round pans also cut out parchment to fit into the bottom of the pans, once fitted inside grease the parchment and then roll flour around the pans tapping off the excess. 2. In a large mixing bowl beat shortening with an electric mixer on medium high to high speed for 30 seconds. Add sugar and vanilla; beat until well combined. Add eggs, 1 at a time, beating well after each. Add cocoa powder, salt and water and mix well. Mix in the baking soda then add flour beating on low speed until combined. Pour batter into the prepared pan(s). 3. Bake for 33 to 40 minutes or until a wooden toothpick comes out clean. Cool layer cakes in pan for 10 minutes. Run a knife along the edges and remove cakes from pans. Cool thoroughly on wire racks. Or, place 13x9 inch cake in pan on a wire rack; cool thoroughly. Frost with desired frosting. Frosting can be as thick and dense or as fluffy and light as you like by adding more or less powdered sugar. Play around with the amount and see what works for you. With a food processor pulse a few strawberries until there’s a half-cup of puree. With a stand mixer or a hand mixer, beat all the ingredients together adding the powdered sugar a few cups at a time until desired consistency is reached. Devil’s Food Cake recipe from Better Homes and Gardens New Baking Book. Frosting recipe and picture by Laura Flowers. Hahaha!! I wish I could have seen you holding up the cake outside. Too cute!! The things we do to yield a decent-looking dish :). It looks so tasty. I never would have thought of combining chocolate with strawberry frosting. Interesting. What a BEAUTIFUL cake. Your standing outside was worth the effort. cake looks so yum,i am droolin here,..
Cake out of a bowl would have been fine with me, I am a cake FREAK! I can do without pie as long as I can be guaranteed some chocolate cake, most days. And other days carrot cake will suffice :) This looks AMAZING! The cake sounds delicious and believe me, I have done and will continue to do the very same thing! Okay YUM! I need a recipe for a birthday cake for Monday! This is it!!! I will be making this cake and this frosting! YUM! YUM! YUM! That is too funny. I can just picture you shoring up that cake in your pyjamas :) I freeze cupcakes for emergency cake days. Your frosting efforts paid off though, that slice looks divine. LOL, I got a good laugh out of this one! I do like a good cake but in this case leave the cake and just hand me a bowl of that frosting, which sounds incredible! Nice looking cake - and perfect for National Devil's Food Cake Day!!!! Did you realize that or is it just a fluke? Is it really national Devil's Food Cake Day??!!! How cool! I had no idea. Your cake looks beautiful! And I'm right there with you. I also tend towards pies, but there are those days when you just need a big fat slice of cake. Thank you for sharing! OMG, that looks so good.. who would have thought chocolate and strawberry go that great together. Good gawd gertie! That looks insane. You had me at hello on this one! I will have to make something like this for my hubby's b-day. He loves strawberry and chocolate. Thanks! That would absolutely be me. Except I would probably be licking the frosting at random intervals. Like you would melted ice cream. And then wondering why there wasn't enough to finish frosting the cake. This is glorious. I am definitely bookmarking it for father's day. I think my dad would love it! Now that is something I would do, but not with cake! I don't mess with cake--it's my baby. You so totally crack me up--wish I could have seen that action! This sounds crazy divine. But you totally shocked me when you said you're more of a pie person. Because I didn't notice the previous 30,000 posts on pie. ;) ahahaha you know I love it! You've kind of turned me into more of a pie person b/c you post so many good recipes I've had to try already three of your pies! All wondermous! And I plan to try more. But maybe this cake first. :) Oh wait, I just vowed not to eat any white sugar for a while. OK, so I'll make it for others! Just b/c I'm not eating it doesn't take the joy out of making it. Well, maybe just a little. Laura....I LOVE the new website layout. It looks so professional! And this cake is gorgeous. Frosting it warm and all. I got a good chuckle about envisioning you trying to hold it up with a spatula while scooping the frosting back on. What a beautiful looking cake. And I'm sure it's delectably delicious. That strawberry frosting looks soo pretty. The cake looks delicious, Laura. Laura . . . The cake was a hit at Christmas Eve dinner after tamales. You can't go wrong with chocolate and strawberry. The frosting is to die for! Everyone commented on how creamy it was and how it tasted like "real" strawberries, which of course, it was. I will make this cake again for sure. very creative to put strawberry frosting on this cake! it looks amazing.